Martin Logan Mikros 70 review | What Hi-Fi? Martin Logan is best known for its huge high-end electrostatic speakers – so it’s interesting to see the company turn its attention to our ear canals. 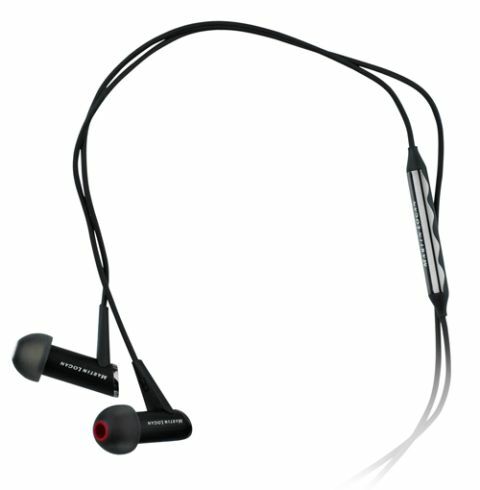 The Martin Logan Mikros 70 is its sole earphone offering; there’s also a pair of on-ear headphones, the Mikros 90s. We can’t really find too many faults with the build quality. The Mikros 70s’ rubberised cable does a decent job of resisting tangles, and the inline remote-and-mic unit, which sits on the left-hand cable, is sturdy enough (although the buttons are a little tricky to press if you’re a nail-biter). The enclosures themselves are made from tubes of anodised aluminium – and are light enough to not drag on your ears in use. They even look like a bit like the USS Enterprise, which is quite cool. The included carry-pouch contains a variety of ear-fittings: two sizes of triple-flanged tips and three of the conventional kind. The latter are helpfully colour-coded with white or red inner portions, which makes it easier to identify which one goes in which ear. We did have one minor mishap with the flanged buds, though. The seal they create is so good that it overpowered one of the silicone parts’ grip on its earphone enclosure – resulting in a heart-stopping couple of minutes when the end stayed lodged in our ear after removing the earphones. Don’t shove them in too far, kids. One pair of tweezers and a cup of tea later, we’re back on track with Muzzle from The Smashing Pumpkins’ excellent double album Mellon Collie and the Infinite Sadness. Everything is present and correct, with a reasonably punchy bass (although a little more thud wouldn’t go amiss), natural-sounding and articulate midrange (which could be a tad more open) and sparkly, sweet-sounding treble (which lacks just the last touch of gloss). A few qualifications, then, but definitely on the right path. Dynamics are good, too, with shifts from quiet to loud dispatched without issue and plenty of space given to instruments, as a listen to Interface by Hank Jones demonstrates. Notes start and stop quickly, with snappy snares and a decent kick to the leading edges of bass-drums. We’re happy with the amount of detail on offer, too – although in absolute terms it isn’t quite up there with products such as the Sony XBA-2iP and Shure SE425. What we do like is the energy the Mikros 70s deliver. Kit testing isn’t all about sitting in rapt attention the whole time; we listen for hours to get inside the sound of a product. So, we had these in our ears while working on other tasks in the office – and there were plenty of occasions when we were compelled to stop and simply listen to the music. We like that kind of thing. So, it’s a four-star verdict for the Martin Logan Mikros 70 headphones. We like everything about them – but we just want more of it. More punch, more room to breathe and more shine to their treble would really kick these earphones into high gear and see them go toe to toe with the very best.